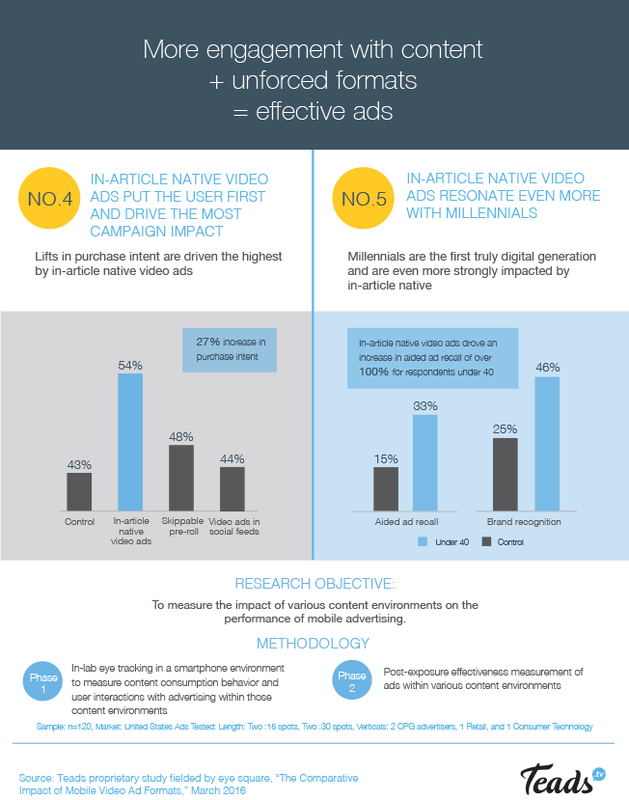 A new report that used eye tracking to understand user engagement with mobile video suggests certain types of video ads on publishers' websites perform better than those on social media. 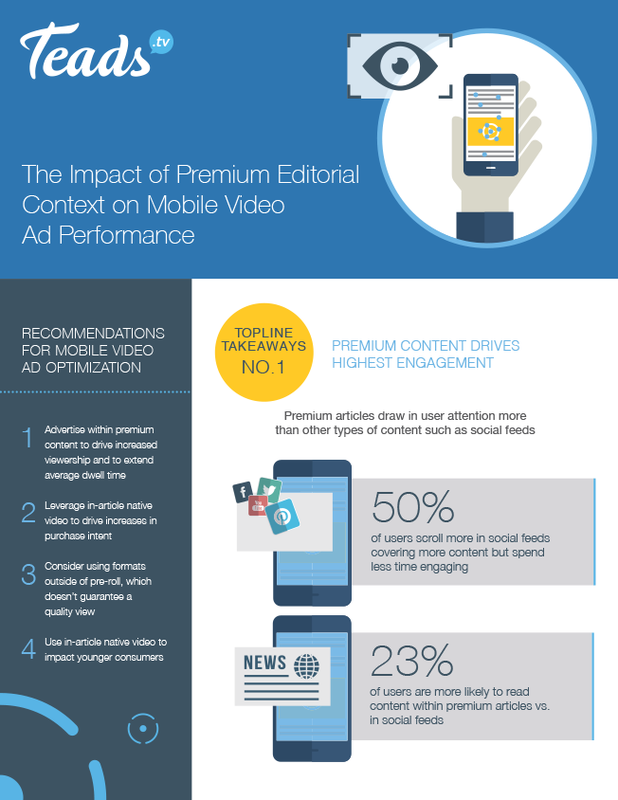 According to a study by Teads, a video technology platform that works with many of the world's top publishers, users spent 24 percent more time watching video ads within premium content on websites than they did watching video ads in social feeds. The results showed that ad recall was twice as high for in-article video as it was for skippable preroll and drove purchase intent 27 percent higher than skippable preroll ads or video ads in social feeds. The report also found that 50 percent of users scroll more in social feeds and cover more content but engage less with ads. 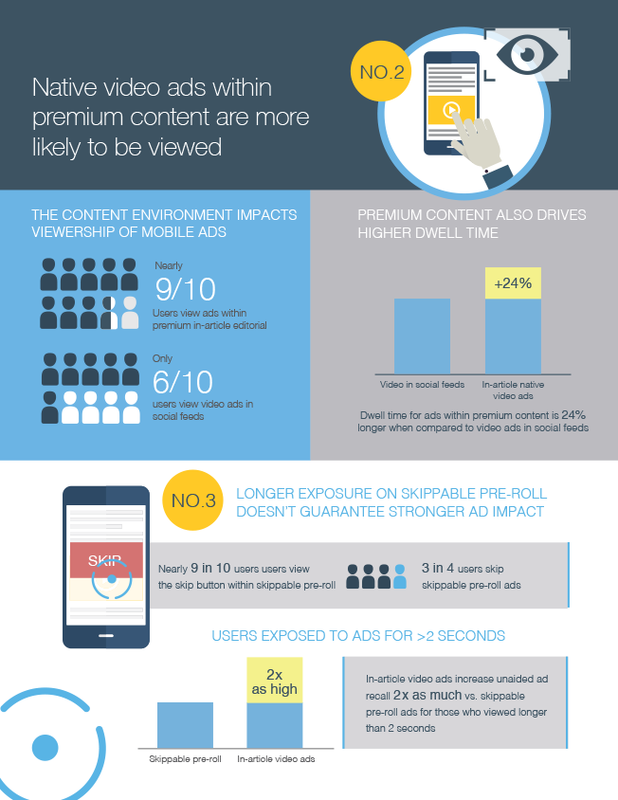 On the other hand, 23 percent of users were more likely to read content within premium articles than in social feeds. According to Teads CEO Bertrand Quesada, the in-article format for publishers is in many ways more respectful of consumers because it seems less intrusive. "People are engaging in a very different manner," Quesada said. According to Quesada, the level of engagement for video ads on Facebook and Twitter was "nowhere near" that of Teads-powered videos on publishers' websites. It's no surprise that Teads is happy about the findings. After all, it is a video company that makes money creating—and selling—video formats for top publishers. But even apart from the eye-tracking study, publishers and advertisers that work with Teads seem happy with the results they're getting. One of the publishers experimenting with a vertical video format recently created by Teads is Odyssey, a social content platform focused on millennials that's on track to hit 100 million monthly unique users by the end of 2016. Ken Nelson, Odyssey's chief strategy officer, said 82 percent of online traffic now comes from mobile. And while video accounts for only part of that traffic, it's growing—just like it is everywhere else. He said vertical video makes sense and is much more intuitive for users than horizontal video. "You've got to take three steps to get a video to play horizontally, versus it comes up naturally when it's played vertically," Nelson said. Teads isn't the only company experimenting with placing native video inside of articles in both horizontal and vertical formats. 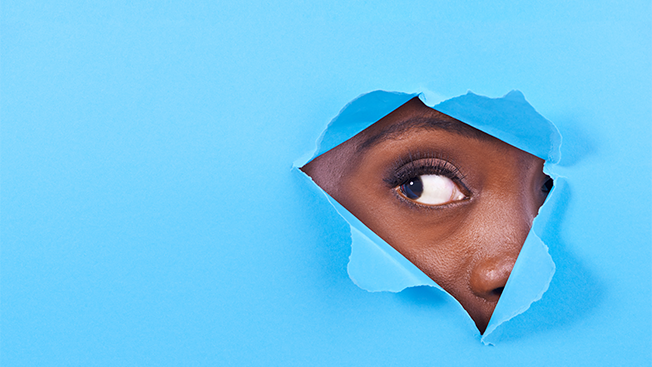 Last month, Teads competitor Virool launched what it's calling Vertical Reveal. According to Jim Daily, Teads' president for the U.S. and Canada, revenue for 2016 in the U.S. market is expected to total between $90 million and $100 million. The company has been investing in outstream native video—ads embedded within articles—for the past two years, working with publishers like the Washington Post, Condé Nast, The Atlantic and Voice Media. "I think the business has scaled quickly because we invented this thing called outstream for native video, and we were doing it for two years before anyone even considered it an option," Daily said. "So, we have green fields of opportunity with very innovative new ad formats for users."